"This is a family recipe from my husband's mom and grandma. 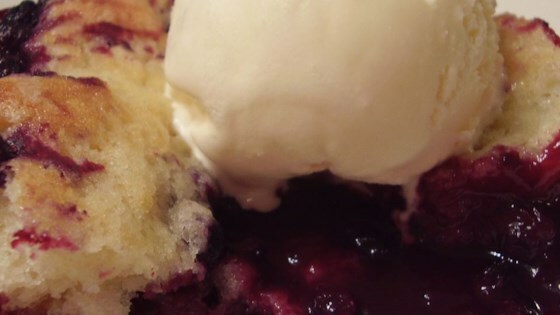 I like it better than the traditional cobbler. This works well with blueberries and blackberries also!" Preheat oven to 375 degrees F (190 degrees C.) Grease the bottom of a 9 inch square pan. In a large bowl, cream 1/4 cup butter and 1/2 cup sugar. In a separate small bowl, combine flour, baking powder and salt. Stir into butter mixture. Stir in milk; mixture will be thick and lumpy. Spread batter into the prepared pan. In a large bowl, combine berries, 3/4 cup sugar and 1/2 cup boiling water. Pour over the batter in the pan. Dot the top with remaining 1 tablespoon of butter. Delicious recipe! Careful when pouring huckleberry mixture into pastry mixture on bottom...pour slow and evenly over the pastry, otherwise the middle is very runny and messy.